St. Patrick introduced Christianity into Ireland in the fifth century and heralded a golden age of Christianity which produced a rich heritage of architecture and ecclesiastical art. 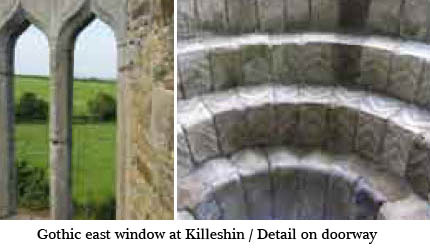 Killeshin was the site of an early monastic settlement associated with saints Diarmait and Comgán. St. Mugen who was abbot here in the sixth century is believed to have taught St. Laserian (d.639) the first bishop of Leighlin. 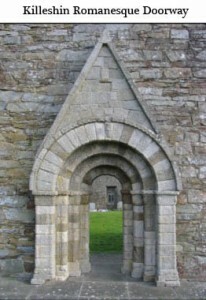 In the eleventh century the monastery suffered as a result of dynastic rivalry in Leinster. It was burned in 1042 and 1077 and thereafter went into decline. The present church was built c.1150 and is well worth visiting not just for its beautiful Romanesque doorway, one of the finest examples in the country, but for its scenic setting. 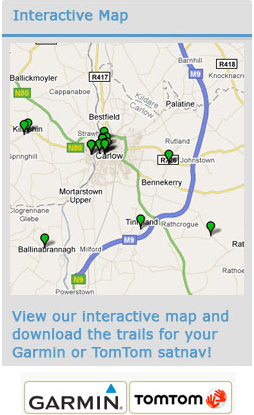 Nestling in peaceful countryside, it has such wonderful views across the Barrow Valley to the Blackstairs Mountains that it has been called the “The Balcony of Carlow”. The doorway is also one of only a small number of doorways in Ireland with a triangular gable above the arches. Partially reconstructed, the doorway has four orders, with capitals bearing heads with intertwined hair and an arch with foliage and animal motifs. It appears that the sculpture was intended to be painted as was common in the twelfth century. Take some time to imagine the painstaking craftsmanship that went into the elaborate carvings on the doorway. Down the hill on the right, 12. 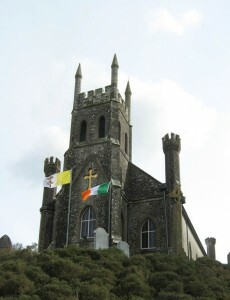 Killeshin Catholic Church was built in 1819-20 to the design of Thomas Cobden. It is a modest but spacious building in stone and brick with Gothic windows and polygonal turrets on each corner.